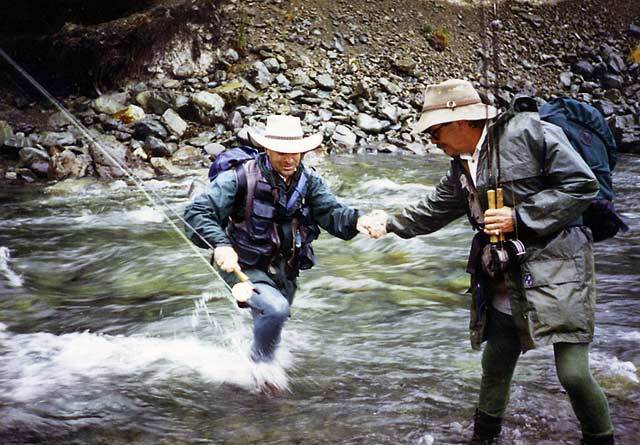 Denis Brundell helping Rod across the Greenstone River. We set off from Dunedin with all the plans for an excellent few days fishing with a friend from Australia Rod Clarkson and my normal fishing buddy Denis Brundell. Unfortunately, our first port of call was to be the Mataura and as we arrived at Gore the rain started. 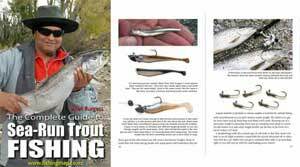 We immediately collected a few groceries and headed for the river which was already slightly discoloured – and after an hour was virtually unfishable. Planning to stay at Waikaia the night we moved upstream to that river. It was still clear in the lower sections although the fish refused to move so being Saturday night we decided to spend some time in the local waterhole and have a meal there. The rain continued throughout the night and the next morning the river was unfishable. There was only one thing for it. Head to Glenorchy which was going to be our next port of call for an overnight stay. We fished our way there catching a few fish in some places that shall remain nameless. The beauty of Lake Wakatipu in the sun is something that Rod continually talked about as we travelled around the side of the lake. We had ended up having a good day catching a few fish and retired to our quarters for the night. All gear was packed ready for the early morning assault on the Caples. The intention was to fish our way up the Greenstone River to the confluence, up the Caples River to Mid Hut, stay there the night, fish around the hut in the morning and walk out late afternoon. With a few stories being told and a few drams, we slipped into bed eagerly awaiting the dawn for our next new fishing experience for Rod. Halfway through the night, the rain on the tin roof of our accommodation awoke us all. Of course, falling water on tin has an adverse effect on one’s bladder especially after they have been drinking and most of us rose for the necessary relief. The morning looked very gloomy as we cooked breakfast and packed our gear into the vehicle to drive round to the Greenstone carpark. Unfortunately, the radio informed us that the weather was going to be like this for at least two days. Being the strong hearty souls that we are we donned our parkas, packs full of gear and headed for our destination. Looking up the Caples Valley it looked pretty obvious that it wasn’t going to stop today but was there enough rain to affect the river. We were unsure so decided to fish on. A few fish were taking but by 12 o’clock it was noticeable that the river was starting to rise and slightly discolour. We noted some very nice trout as we moved up and also caught some on the dry ﬂy using Stimulators and small Royal Wullfs. As we reached the fan opposite the old homestead Denis called out from the opposite side of the river to Rod and I that he was starting to feel the cold. We crossed the river and had a discussion about what to do next. Whether we should walk on up and spend a night in the hut and then walk out in the morning or just walk out and forget about staying in the hut for the night. Some of us were wet right through from the rain and others were wet from the sweat wearing parkas that don’t breath so well. We reckoned it would take us two hours to walk out and roughly three-quarters of an hour to walk to the hut. Checking the gear, one of the sleeping bags was wet where water had leaked through a pack and through a small hole not noticed in the plastic bag that it was wrapped in. Some of the food was also slightly messy. In fact, the scroggin was a wet gooey mess of peanuts and bits and pieces. 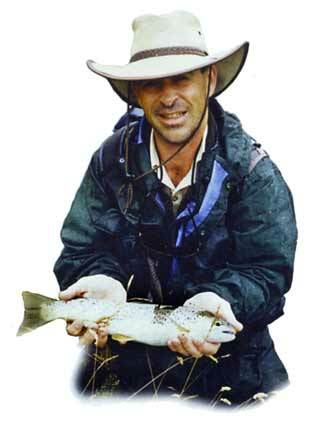 Rod Clarkson holding a brown trout from the Caples River. Photo, Monty Wright. At least we had caught some fish so that was pleasing. We had seen a couple of big buggers too which also brought an adrenaline punch to the system. Unfortunately, the best one saw us first. 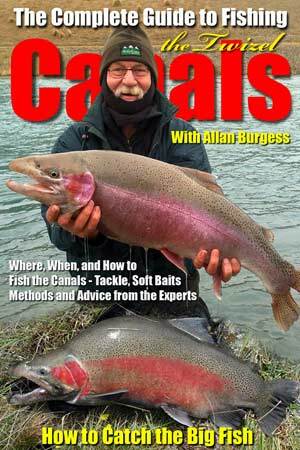 Not uncommon for angling in this river. As we headed on back down the track to the vehicle everybody was slightly depressed. Our plans had gone really wrong, confused by mother nature and that damn hill from the Greenstone bridge up to the rise before you drop down to the carpark seemed to go on forever. But finally, we made it back to the car. Piling everything in we headed back to our accommodation where we had left the rest of our gear. Everything was up and discoloured. All the creeks, the Dart was in ﬂood, Diamond Creek was in flood, the Rees was in ﬂood so there was only one thing left to do. Pile all the gear in the vehicle and head straight for Hawea. At least there we had Denis’ accommodation where we could lay everything out, dry out and be nice and warm for the night. We were pretty tired boys by the time we reached there, cooked some food and slid into bed. One of the locals had informed us that it had only rained for about an hour and a half during the day so that was pleasing. There would be plenty of good clear water to fish around Hawea. How pleasing it was to wake in the morning and see the sun beaming down on Lake Hawea and again we could turn our minds to more fishing.